Mangoes are processed into mango puree for re-manufacturing into products such as nectar, juice, squash, jam, jelly and dehydrated products. 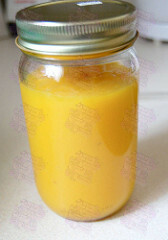 The mango puree can be preserved by chemical means, or frozen, or canned and stored in barrels. This allows a supply of raw materials during the remainder of the year when fresh mangoes are not available. It also provides a more economical means of storage compared with the cost of storing the finished products, except for those which are dehydrated, and provides for more orderly processing during peak availability of fresh mangoes. 1. Wash table ripe mangoes to remove dirt. 2. Slice and scoop out flesh from the cheek halves. 3. Peel and scrape the remaining flesh from the seed. 4. Liquify flesh in a blender for 2-3 minutes. Strain. If blender is not available, mash the flesh well and strain. 5. Place resulting puree in a stainless kettle. Add 1/2 cup sugar and heat until the mixture’s temperature reaches 820 C (near boil). 6. Using a clean plastic cup or soup laddle, fill puree into sterilized jars. Fill only up to neck of the jar to give headspace. Cover bottle tightly. 7. Process in boiling water for 30 minutes. Make sure the bottles are completely immersed in boiling water. 8. Remove bottles from casserole and cool. To check for leaks, turn jars upside down in a clean damp cloth, then with a dry one. 9. Label and store in a cool dry place. 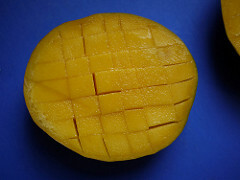 If a mango grower has plenty of unripe fruit rejects(except for mangoes inflicted with fungus) green mango puree can also be made using this procedure.